Chief Information Officers (CIOs) across Greater China (Hong Kong, Mainland China and Taiwan) have expressed their optimism toward the technology job market in the next 12 months in the recent Michael Page 2015 Greater China CIO Viewpoint. In terms of the main business improvement projects, CIOs are primarily concentrating on improving processes such as data consolidation and sales operations, but improving experiences for mobile and wireless devices will be key moving forward. 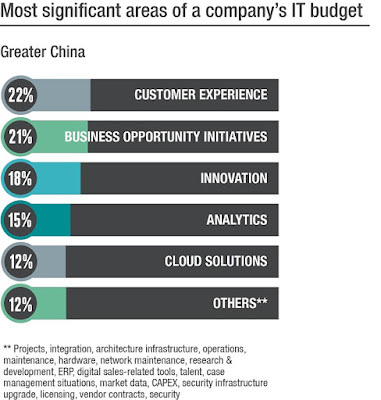 In the next 12 months, mobility is nominated as the top area for new technology spending by CIOs in Mainland China and Hong Kong, while in Taiwan, where CIOs are much more focused on managing the drivers of business performance, cloud services are ranked as their top priority for 2016.